I'm a mechanical engineering student in Turkey and I love pencils. I buy pencils for using not for collection purposes. I have used rotring Steadtler Pentel pencils so I think I have a fair amount of knowledge. I have been using Lamy Logo 0.7 Stainless Steel version for about 1 week. About the BODY: The finish of this pencil was one of the reasons I bought this pencil. Beware It looks more shiny than one the picture here and the original Lamy site. And the body looks beatiful to me in all lightening conditions, especially in clody weather with no artificial light. Other thing about the body prevents slipping of my fingers. 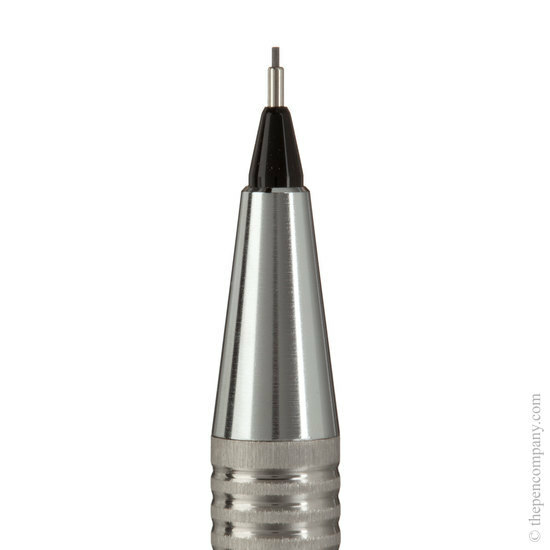 My fingers are quite sweaty and this brushed finish is almost good as knurled grip section of some technical pencils. I would say it is not phenominal for quite dry hands in terms of preventing slipping but the it is definitely better than the glossy plastic found on most entry level pencils. Ok, so the body also extends to GRIPPING SECTION: Gripping section is actually the body itself, with 10 grooves. Grooves are not rectangular, or harsh. And although I hold the pencil squuezing from the grip area (I squueze more than average person) and this grooves still didn't bother me, which is really good. 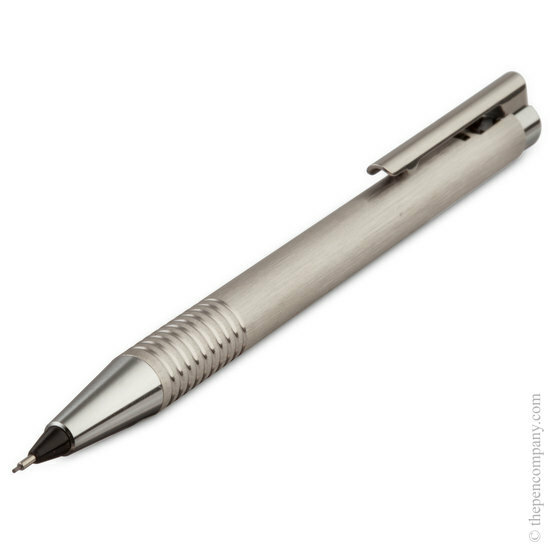 I would say while I tested the Lamy econ in local shop here, it's grooves were deeper and the grooves edges were quite edgy, while squuizing it it bothered me a bit because I could feel piece of my skin was like trapped in them for a little moment. But Logo's grip section is nice for me and I would say it would be still quite good for average person as well. Body goes the front section of the pen. And the joining of this area is really good. Tolerances are great If there is no colour diffrence between the body and the pencils front end I wouldn't be able to tell the diffrence between the body and the front section (which is what exactly happened while my frend showed me his Lamy 2000 front section was remowable:). So thumbs up for good tolerences :D. But the black area which holds the removable tip of the pen is not firm for moving left , right etc (but not inwards or outwards of the pencil). So it does have some play. And the removable tip of the pencil also have some play, as well. So adding up, it does have some play, and this play is not homogenious completely (or at least in my unit :D). So this is considered generally bad but to the contrary I would say it is not. For general writing and sketching, this make writing a bit more comfortable and little flex gives kind of a joy feel, trust me :) But If you are doing technical drawing or some drawing you don't want that. I would recommend you to go for not recractable tip for these. The WEIGHT of the pencil is I would say light to medium, which is really good for general writing and fast note taking. And It is the most homogenious weight distrubuted pencil I have used :) It is good for high angle and low angle gripping styles. But I would say more for high angle gripping styles. I have used Lamy Safari and Al star (of my friends) and their weight were more adjusted for 60 degree holding, which is how most people grip while writing. The Diameter of the body and naturally the gripping section is a bit thicker for my taste. If it would be just a little smaller (thinner) It would be perfect for me. The CLIP. Ok the clip has some good points and major drawbacks for me. Clip is spring loaded. And it's really really good for me because after some use (even I don't) most clips look, like you can see it's not straight. 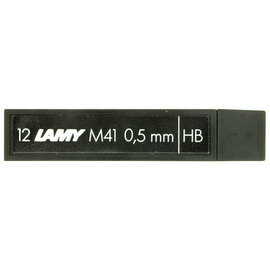 (Deamn plastic deformation in Mechanical Engineering :D) But I don't think I will encounter with this problem in Lamy Logo. But it's flexing range is not much, and flexing stops immediately at it's limit. Now I'm gonna tell you about the story about the problem with the clip, and the mechanism which makes noise. Otherwise mechanism is good for now. The clip is attached to the moving mechanism of the top. (You push the mechanism and the clip moves with the mechanism) And when the clip moves on the body I was afraid about it will scratch the body quite easily. But when I looked at it I saw the clip makes a diffrent concact with body. They put a little ball in there eeeh my English is not enought but I will try. 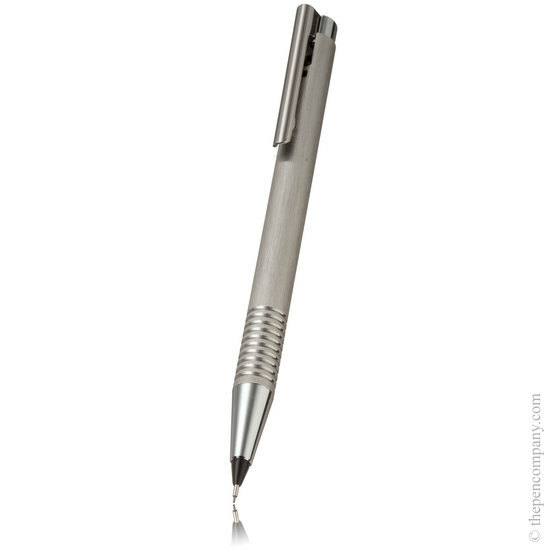 There is little rod and a ball is attached to the ball so that ball can rotate to front section of the pen and the back section of the pen. Now this is good and for 1 week of use it protects the body quite well. BUT the problem is since the ball's only small portion (almost a point) is making contact with the body, and the there is play in spring mechanism of the clip, while I am writing the clip can move clockwise, counterclockwise, and mostly out direction when it makes contacts with my hand. And I don't like that feel :/ This problem exist on many entry level pencils but Lamy, as a Pen only manufacturer I would like to see some engineering to prevent this as well. And the other problem is with the mechanism noise.